Why choose Scoil Aoife CNS? This school will offer your child a warm safe environment where they will begin their journey of learning. In this school we will LISTEN to each other, SUPPORT ,ENCOURAGE, ACCEPT, RESPECT, and TRUST each other. Where there are differences we will NEGOTIATE . Children will be facilitated to always “do their best” in a safe environment which will stimulate and motivate them to reach their full potential. Parents are invited to take an active part in this community school, collaborating with staff to provide a need satisfying education for their children. Literacy and Numeracy skills will be developed effectively from day 1, equipping these children with the skills for lifelong learning. 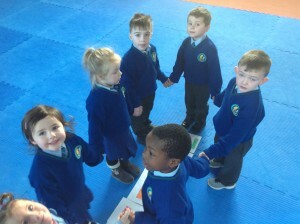 Scoil Aoife will endeavour to foster in it’s students a love of Music and Drama and an appreciation of the Visual Arts. They will explore dance and begin their school days with a healthy appreciation of physical fitness. This system will provide the very best of all religions and beliefs thus ensuring a mutual respect for one and all. We will foster links within the community with local businesses and sports clubs encouraging an awareness of the importance of this involvement.